To be the preferred supplier of Cold Chain delivery and storage systems for users of temperature critical products. CoolPac is committed to supplying quality solutions for Cold Chain management. To meet this commitment, CoolPac maintains a quality-focused culture to ensure the highest priority is placed on the reliability of the products and meeting customer expectations. CoolPac management is committed to maintaining a quality culture with appropriate systems and processes in place to drive quality-focused behaviours and to continually improve the processes. 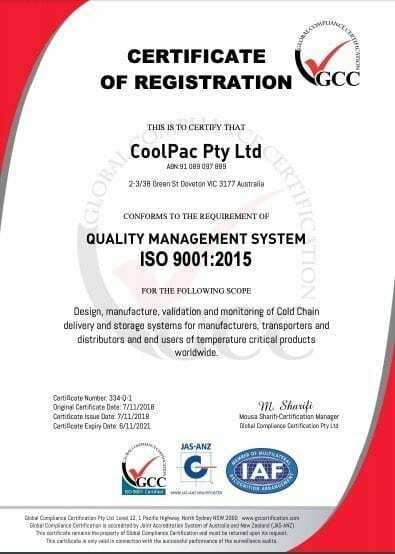 Each employee in CoolPac is accountable for ensuring product quality.CoolPac is committed to complying with the requirements of ISO 9001:2015. CoolPac strives to continually improve the effectiveness of the Quality Management System by periodically reviewing and updating the Quality Management System as appropriate.